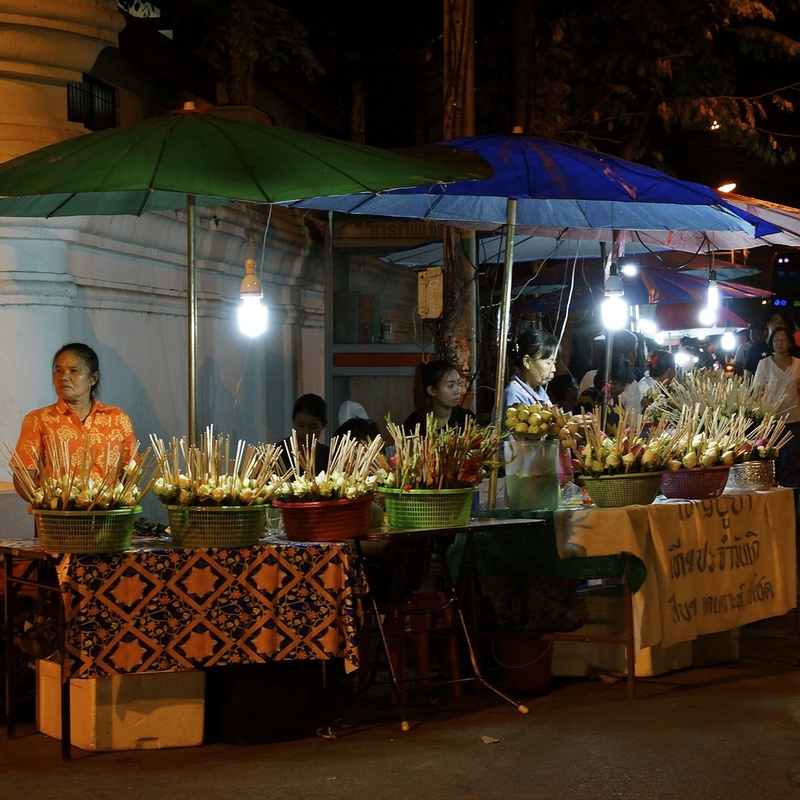 Around every corner, Chiang Mai was full of surprises. As usual, we arrived at a bus station outside of the city. We grabbed our bags and found a songthaew (shared tuk-tuk), threw our bags on top of the little vehicle, and headed into the city. 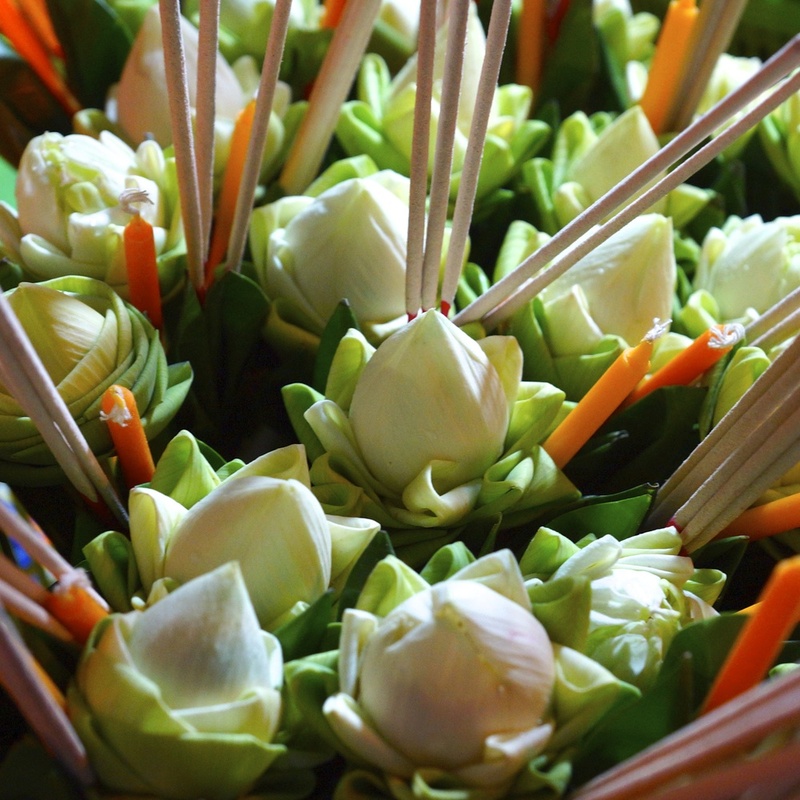 We hadn’t reserved a guesthouse since we decided to leave Chiang Rai that morning, and we quickly learned that it was a holiday (Buddha Day) in Thailand meaning almost everything that was reasonably priced was full. When we found a guesthouse in our budget we jumped on it. Air-conditioning is not a luxury we pay for while backpacking (rooms are about double the price), and when we got up to the room we quickly came to learn that the fan barely worked. When it’s 103 degrees out, this makes for a very hot little room. That said, we ran out of the room about as fast as we ran into it. As we made our way down the stairs and onto the porch where we ran into a gentleman who came to Thailand 30 years ago on vacation and never left. He was our first surprise in Chiang Mai. He liked to spit out a lot of fun facts, which I found pretty funny. He asked me if I’ve learned any Thai. Unfortunately, I don’t know much more than hello, please, and thank you, I told him. So, he told me Chiang Mai means “New City.” Then he continued by saying, “Mai, Mai, Mai, Mai, Mai.” I stared at him, a bit confused. He said, now you know nine words. When you use the different tones, mai means five different things. So, if you would like to say, “New wood doesn’t burn, does it?” all you need to say is “Mai (high tone), mai (low tone), mai (falling tone), mai (falling tone, longer vowel), mai (rising tone).” Easy as that. And that’s how my first few days in Chiang Mai began. 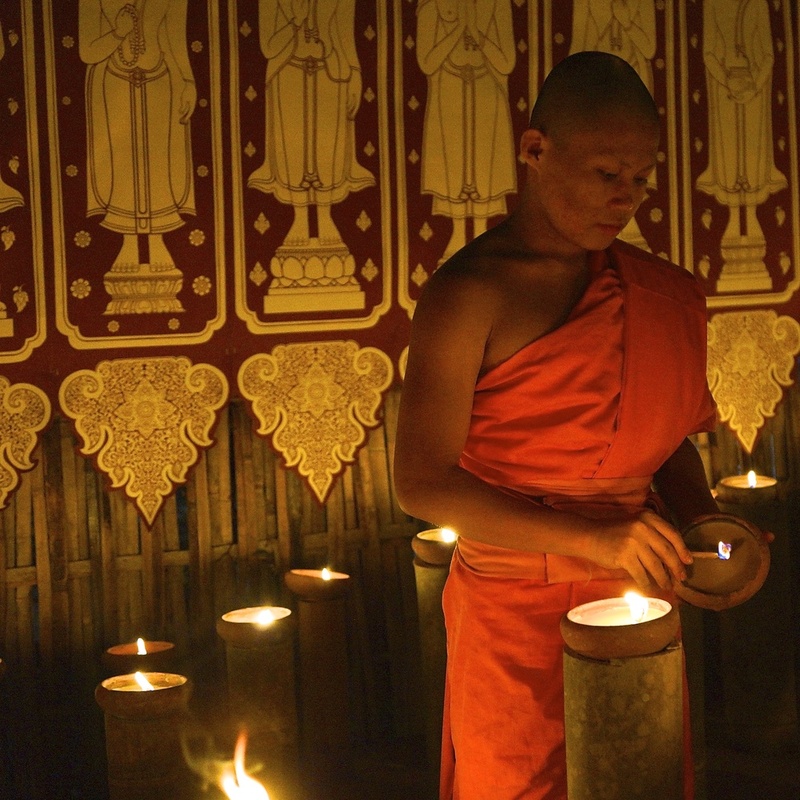 As the sun began to set, the city was lit up with candles for Buddha Day. 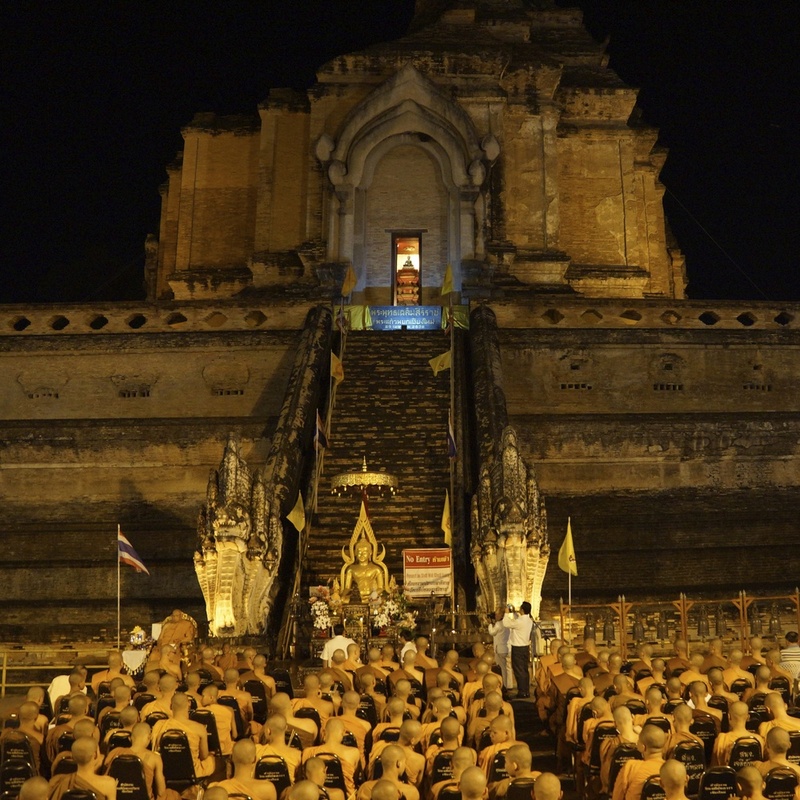 Massive ceremonies were held at the temples throughout the city and the sale of beer (or any alcohol) was prohibited, which had some travelers downright frustrated. We decided to go and watch one of the ceremonies. Although I couldn’t understand anything, it was interesting to watch locals buying offerings, such as flowers and food, to leave for Buddha. We went to play with tigers at Tiger Kingdom (a 20 minute tuk-tuk drive from the city). Unlike a lot of places that house tigers that people are able to visit, the tigers aren’t sedated at Tiger Kingdom. Tigers nap nearly 18 hours per day, so when you pet them and play with them they’re usually sleepy, making them a bit tamer. It turns out they’re ticklish when you touch their stomachs, so if you want to see them a bit more active you can tickle them a little. Tigers truly are like giant cats… with really big teeth. When we got back into the city we were walking around when a very energetic English man stopped us in front of a school. He turned out to be the English teacher and asked us if we could come into the school to help the kids practice English for a bit. I asked them their names, how old they were and since they were learning flavors, we talked a lot about ice cream. I learned something from them too; I learned how to say taengmo (watermelon). I’ve never tasted watermelon ice cream before, but one little boy insisted it was the best flavor out there. Before we left, they sang us a song and asked if we could take a picture with them. It was an unexpected surprise and fun to see what the schools look like in Thailand. 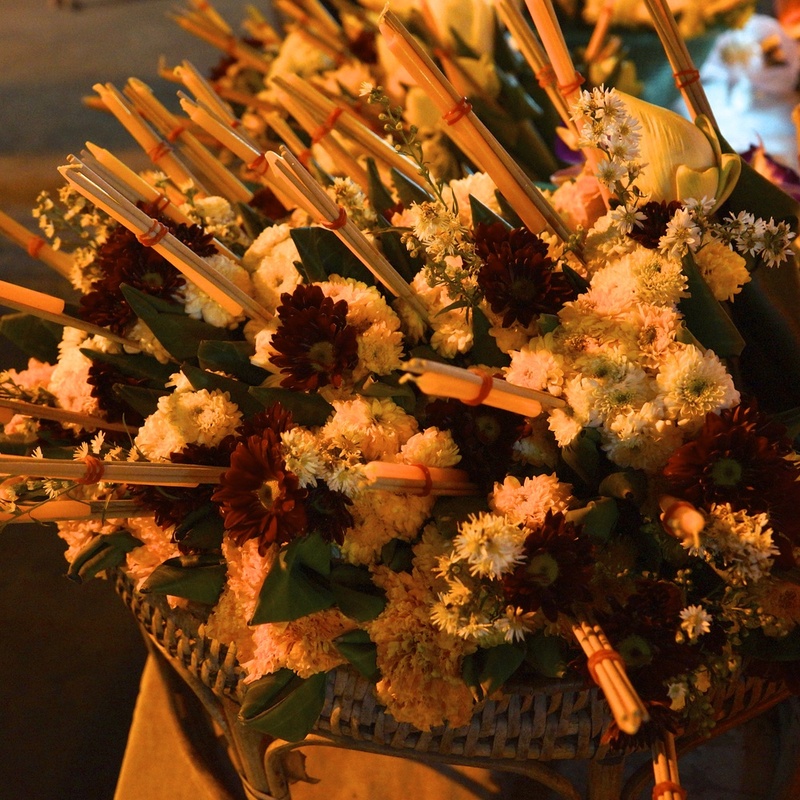 We spent another day wandering through the city, exploring the night markets, and taking in life in Chiang Mai. The next morning we got up at the crack of dawn and waited for a mini-bus to pick us up. We went on an excursion to ride and wash elephants! I’ve rode horses and camels before, but riding an elephant was absolutely magical! Vincent was able to get on by stepping on the foot and jumping up; I, on the other hand, was a little too short since we had the biggest elephant in the group of four. I climbed onto a tall platform to get onto the elephant. I thought I’d hurt him by sitting on his neck, and then when I realized his ear was about the size of me I was assured he’d be just fine. We fed him A LOT of bananas, but since he eats around 600 pounds per day, we stopped for him to pull down a few branches to munch on, too. I gave him a mushroom, but apparently elephants can be picky since he spit it out. After we walked through the jungle for a while, he took the lead and went down a hill and began to wade through a river. Soon enough, we were in the river too giving him a bath. For an elephant, being scrubbed down is like going to a spa for a human. That said, he was a very happy elephant. As always, our schedule changes on a daily basis. We were planning to go to Laos, but as we began to look at everything we wanted to see and do there it didn’t seem doable for our time frame and budget. Since we have a trip planned to Cambodia to meet up with one of my good friends, we decided that it would be better to see one place well than to only scrape the surface of a few. Once we made that decision, we hopped on an overnight bus back to Bangkok. The bus schedules are never what they say; we ended up being dropped off in Bagnkok at 4:00 a.m. It was a fun time to see the city; parts were lit up so bright I thought I was in Times Square. As we made our way to the bus station (walking, bus, and metro) we ran into all sorts of people. Some were setting up the market, others were heading home after a long night out, and others were sleeping on restaurant bars. Bangkok nightlife sure is unique. By 7 a.m. we were on our next bus and headed to the beach town of Ban Phe.